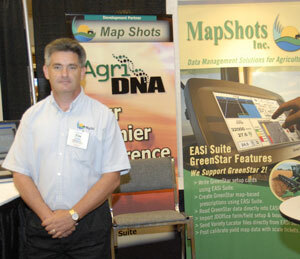 MapShots is a software development company specializing in crop management applications for agriculture. The company’s flagship product, EASi Suite, is a desktop software application that is a complete crop management software package, providing crop planning, crop recordkeeping and GIS/Precision Ag functionality. Let the farm shows begin! The annual Virginia Ag Expo will be held Aug. 8, beginning at 7:30 a.m., at Renwood Farms in Charles City County. 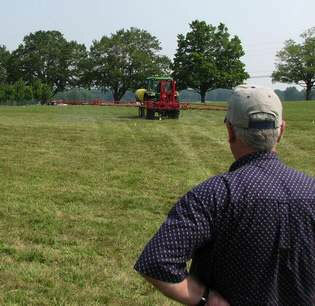 The annual event is the largest agricultural field day held in the Commonwealth of Virginia. Renwood Farms is a large grain and seed processing farm located on the James River, not far upstream from the historic Jamestown settlement, which celebrated its 400 birthday this year. Growers will have an opportunity to view the 2007 Virginia on-farm corn and soybean test plots. There will be corn and soybean seeding rate plots, corn and soybean weed control plots, seed treatment and fungicide plots. Participants will be able to go from exhibit to exhibit and visit with the various exhibitors at their own pace. The theme for this year’s Expo is “400 years of American Agriculture”. In addition to the many exhibits, and things to see on this operation, field plots will highlight corn and soybean varieties, plant population/density research, corn response to nitrogen, and antique corn varieties. Secretary of Agriculture Mike Johanns is scheduled to be the keynote speaker for the 2007 Expo. 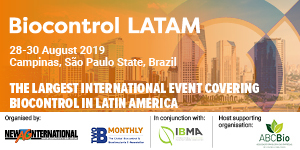 Rick Tolman CEO of the National Corn Growers Association and senior leadership of the American Soybean Association will also be on the program. A large outdoor exhibit area will give farmers an opportunity to see the latest farm equipment and products and provide an arena for visiting with industry leaders during the Expo. There is a $10 registration fee which includes a barbecue lunch, snow cones and beverages. For ticket information and directions to Renwood Farms contact John Smith (johnwsmth@aol.com) or Molly Pugh (mollypugh@cox.net). The 2007 Virginia Ag Expo is a joint project of the Virginia Corn Growers Association, the Virginia Soybean Association and the Virginia Cooperative Extension Service. Information/story courtesy of Southeast Farm Press. Managing data well on the farm can help growers harvest a wealth of information to help them operate more efficiently. 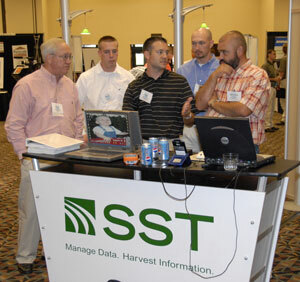 One company that helps growers do that is SST Development Group of Stillwater, Okla.
“We’re really focused on providing tools that let growers have more information about what’s going on out in the field so they can learn what’s working and what’s not working,” said Matt, seen here demonstrating those tools at the recent InfoAg conference. Precision ag is an important segment of the products and services offered to members of the Central Valley Ag cooperative in Nebraska. 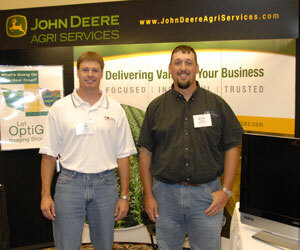 Glen Franzleubbers of Oakland and Keith Byerly of Tilton attended the recent InfoAg conference in Springfield, Illinois where they stopped by the John Deere Agri Services booth. Glen says their precision ag program at CVA is called Advanced Cropping Systems. “It includes grid soil testing, directed soil sampling, variable rate fertilizer, lime, yield mapping, yield monitor support, and also the John Deere OptiGro imagery,” said Glen. Keith says they have been amazed at the resolution of the OptiGro imagery. “Once we really saw what the resolution was, how detailed it was, I was impressed with it enough to take it to more growers than I initially planned,” he said. Both said that grower feedback has been very positive. Remember to visit the site on a regular basis for the latest information on precision farming. For more information, you can also visit the John Deere Web site. WAAS Satellite Changeover Tomorrow – Are You Ready? Tomorrow, July 31, two satellites in the Wide Area Augmentation System constellation will be shut down by the government. The two satellites that have taken their place have been active and working for some time now, but the shutdown will have an impact on the differential correction accuracy of certain GPS receivers. The two satellites, numbers 122 and 134, are scheduled to be shut off permanently at around 8:00 am EST. Many GPS receivers currently in service were configured specifically to lock into signals from those specific satellites, and must be reconfigured by the manufacturer. In the field, these units will not be able to achieve differential correction. Some units manufactured by Midwest Technologies/TeeJet, Raven Industries, Trimble, and Hemisphere GPS are among those affected. For more information, click here. Welcome back for more information from the American Soybean Association (ASA) and John Deere “Reach for the Stars” summer grower meeting in Bettendorf, Iowa, on July 20th at Scott Community College. During the morning presentation, three of the Reach for the Stars winners offered experiences and observations they’ve had while using John Deere precision ag systems on their own farms. They were: David Oberbroeckling, Davenport, Iowa, Chris Von Holten, Walnut, Ill., and Curtis Claeys, Delmar, Iowa. Visit the John Deere Web site for more information about the GreenStar™ 2 system. 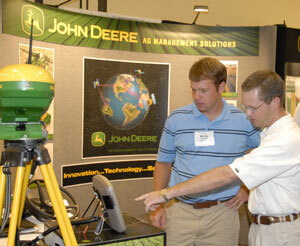 Precision agriculture was in the spotlight last week at a University of Kentucky College of Agriculture field day. The historically inexact science of applying herbicides to crop fields is getting more precise and less expensive as recent technology allows individual nozzles on sprayers to be activated and shut off by computer. Scott Shearer, a University of Kentucky biosystems and agricultural engineering professor, demonstrated nozzle controls last week that use global-positioning system information to eliminate overlaps as sprayers with 90-foot-wide booms pass through Kentucky’s often oddly shaped fields. While most existing boom controls shut off sections of the sprayer, the technology being promoted by UK allows individual nozzles to be turned on and off. Precision ag management is a consulting specialty for some, like Nicky Burgess of Fullen Land and Management Partners in Ripley, Tennessee. The main tools Burgess says they use are auto-steer, variable rate control on sprayers and other application equipment, and record-keeping software.